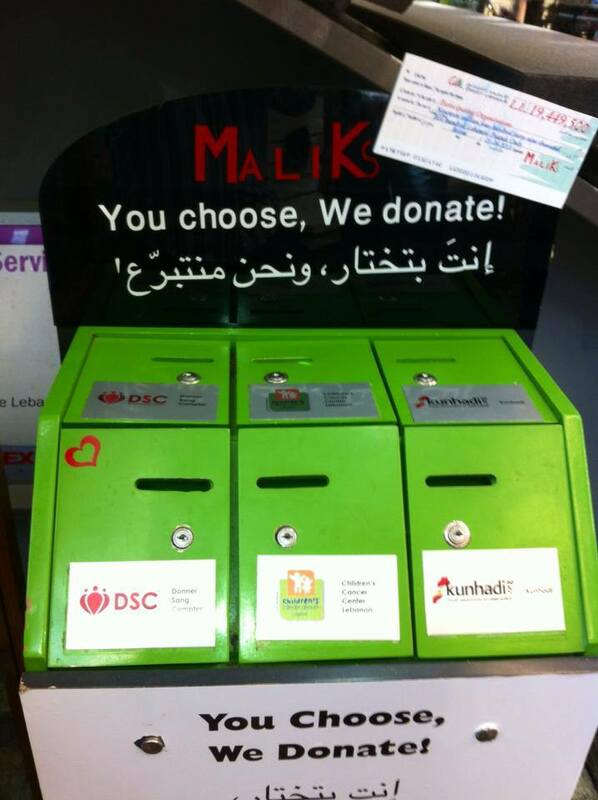 »Press»Malik’s Lebanon’s 2013 Donation Campaign Message! Malik’s Lebanon’s 2013 Donation Campaign Message! If you haven’t heard of it yet, Malik’s Lebanon are our official merchandise seller in the country! “After the success that “You Choose, We Donate” Malik’s donation program received from customers and organizations, we decided to carry on with it to maximize its impact. Therefore, this summer we decided to boost our Donation Program and started supporting three different organizations. The first organization is The Children Cancer Center, the care center which provides access to free treatment and care to all children with cancer in Lebanon and the region, without any discrimination. Kunhadi , the second organization who provides youth awareness regarding driving and road safety. As to the third organization, the Donner Sang Compter, this center consists of a centralized organization that compiles a database of potential volunteers who are generously willing to donate their blood, platelets and plasma to patients in need. Our main purpose is to maximize the opportunity of each organization to increase part of the financial help it needs. This way, each six months, three different organizations will have the equal chance to participate in our campaign. This campaign was launched by Malik’s in late 2010 and was received favorably by customers and all organizations contacted. Throughout this ongoing campaign, customers could and can select an organization they would like to donate to, and Malik’s will donate one percent of its proceeds to the organization of choice by the customers. Currently, all of the 20 Malik’s branches have these special donation boxes addressing the three participating organizations represented by the Children Cancer Center, Kunhadi, and Donner Sang Compter. In conclusion, Malik’s would like to thank every customer who actively made a choice to donate. It is because of these thoughtful customers that charitable organizations like the three we are boosting now have valued support and extended hope.